NECA has released final packaging photos for the upcoming The Nun – Valak Possessed Nun 8″ Retro Clothed Figure. 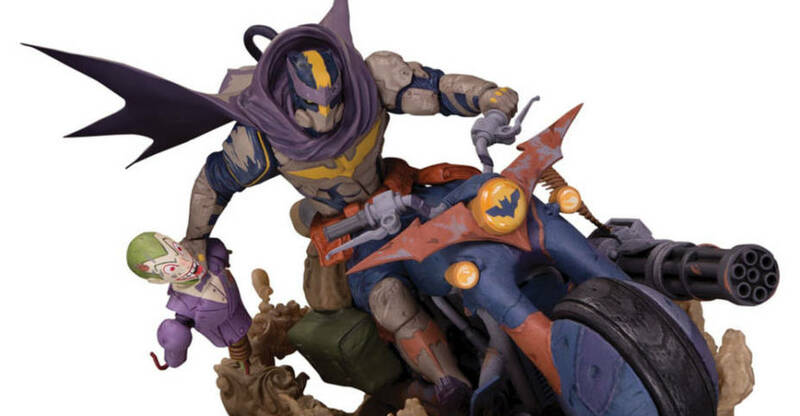 The figure is currently listed for a release in the second quarter of the year. The Nun is the fifth film in The Conjuring Universe, and acts as a prequel to the original film. 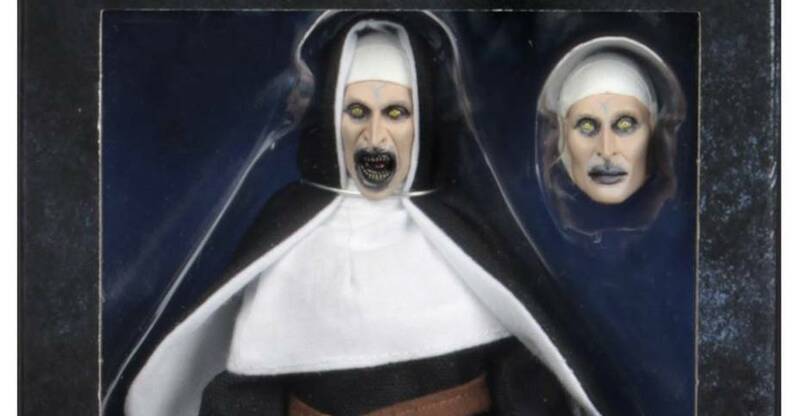 The figure shows the Valak possessed Nun, and includes two interchangeable portraits and a cloth outfit. See the new photos after the jump. From The Nun, the terrifying new movie in The Conjuring Universe, the demon Valak takes action figure form! The outstanding new NECA Original – Street Scene Diorama is available now from the NECA eBay Store and the NECA Amazon Store. This massive set is a complete repaint of the TMNT Street Scene Diorama, which was a San Diego Comic-Con 2018 Exclusive. The dio stands over 18″ tall, with multiple levels, and a reversible display bacdrop for the rooftop portion. It’s priced at $99.99 plus shipping, and will hit retail and online stores within the next few weeks. 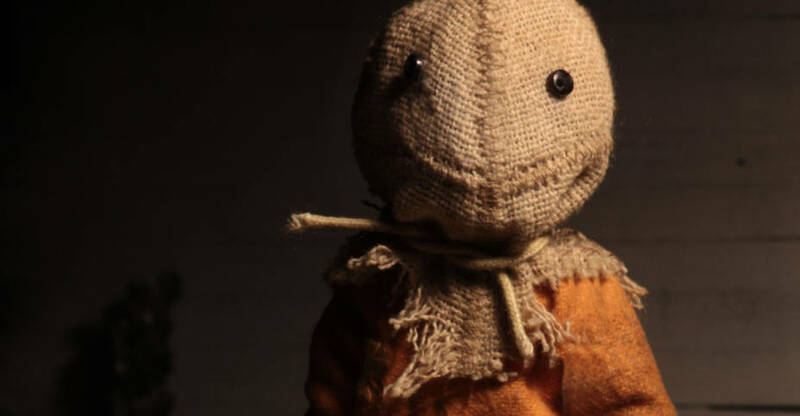 The devious Sam from Trick ‘r Treat joins NECA’s clothed figure line up. Trick ‘r Treat is an excellent anthology horror film by writer and director Michael Dougherty, who is directing Godzilla: King of the Monsters. Sam is featured in the film as the character that ties each of the stories together. If you break th rules of Halloween, then you’ll pay the price. The new 8″ scale figure includes a removable burlap mask, a burlap trick or treat sack, and his half eaten lollipop. Sam stands about 5″ tall. 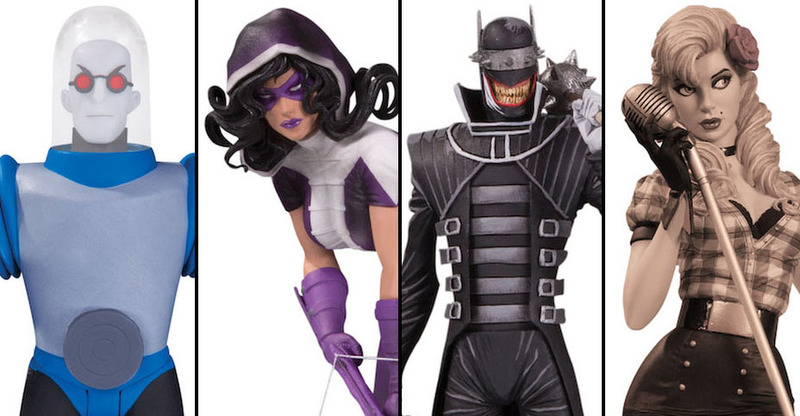 The figure is set for a third quarter release. 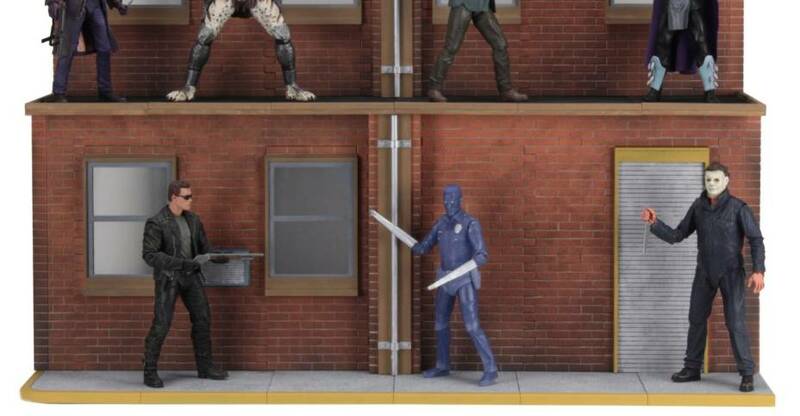 NECA sent over the official images and you can see them by clicking the headline of the story. NECA proudly presents the return of Sam, the mysterious trick-or-treater from 2007’s cult classic film, Trick R Treat! In scale with NECA’s other 8” clothed figures, Sam stands at approximately 5” tall and is dressed in his footie pajamas featuring a removable burlap sack that reveals his unmasked head with jaw articulation. Ready for Halloween night, Sam also includes a Trick or Treat bag and lollipop. Comes in clamshell packaging featuring custom art made just for this release. During his amazing run of films in the 70’s and 80’s, director John Carpenter created iconic horror characters, and revered cult classics. Among those releases is They Live, which tells the story of a nameless man just looking to get by when he stumbles into the realization that Aliens are hiding in plain site. Through the use of specialized sunglasses, he can see not only who is not human, but the hidden messages they use to communicate. NECA delighted horror fans by revealing a 2-pack of the Aliens. 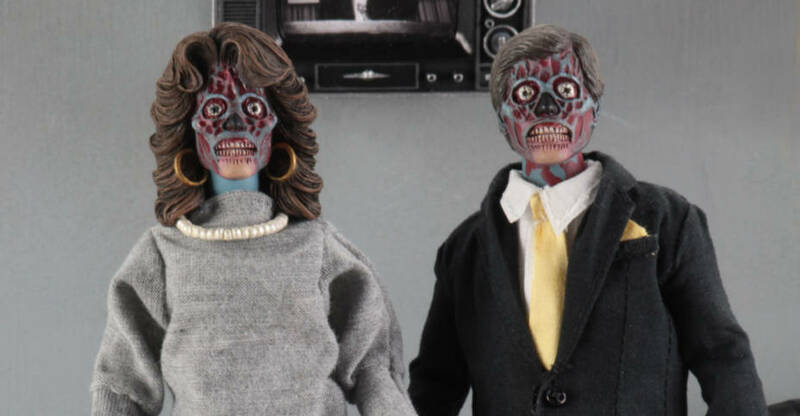 The upcoming They Live – 8″ Scale Clothed Alien Figure 2-Pack is set for release in the third quarter of the year. It includes a male and a female alien, as well as a TV showing one of the hidden messages. NECA sent along the official photos and details. See the pics by clicking the headline of the story. Consume! Obey! A truly underrated movie of the ‘80s, They Live had a fun sci-fi premise hiding a deeper social commentary about the manipulation of the masses via advertising. Horror master John Carpenter directed the film about a ruling class of aliens hiding in plain sight and controlling the people via subliminal signals in media and commercials. For the first time ever in action figure form, see the aliens as they really are without the aid of technical sunglasses in this clothed action figure set, featuring a male and female alien. Both figures come with the wristwatches that transport them to the alien command center, as well as television, magazine, newspaper and necklace accessories. Window box packaging. 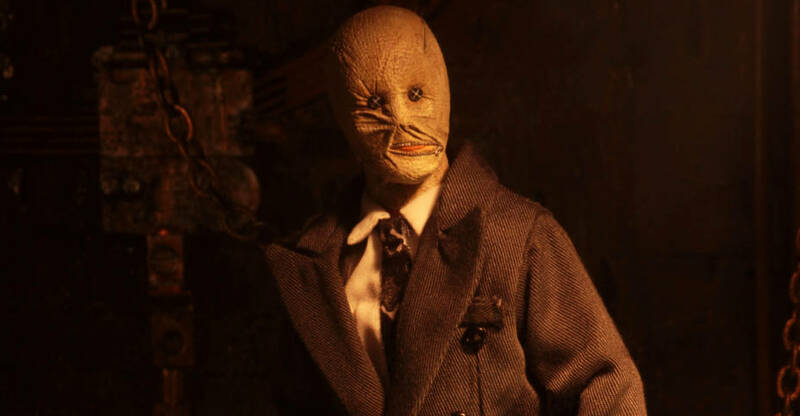 An unexpected addition coming to NECA‘s retro line was the debut of the Nightbreed – Dr. Phillip Decker 8″ Clothed Figure at Toy Fair 2019. The iconic Clive Barker film tells of how humans can be bigger monsters than the creature they fear. Legendary director David Cronenberg portrayed Dr. Decker in the film. The masked figure includes a briefcase that houses multiple knives and blades. It’s set for release in the third quarter of the year. Check out the official photos after the jump. By popular demand, Nightbreed comes to NECA’s clothed action figure line! From Clive Barker’s cult classic fantasy horror film, the serial killer masquerading as a psychiatrist is now an 8” clothed action figure. Decker is fully posable and comes with the tools of his grisly trade – knife and briefcase that opens to reveal three more removable weapons inside. The resealable clamshell packaging features custom art created just for this release! 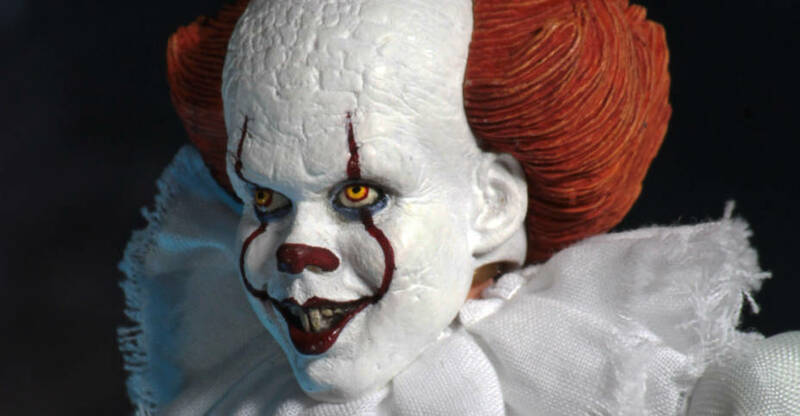 Pennywise 8″ Scale Clothed Figure debuted at Toy Fair 2019. The figure is based on IT (2017). The 8″ tall figure includes interchangeable hands, two swappable portraits, and a red balloon. Look for it to be released in the third quarter of the year. NECA sent over official photos, and they can be seen after the jump. From the acclaimed 2017 horror film IT, drawn from the pages of Stephen King’s original novel, NECA presents its most deluxe and elaborate clothed figure ever! The ornate costume of Pennywise The Dancing Clown has been painstakingly tailored in high-end fabrics to create this amazing action figure! Each costume is individually sewn, creating a truly one-of-a-kind collectible. Based on Bill Skarsgård’s portrayal of the nightmare-inducing clown, the 8” figure also features two interchangeable head sculpts, three interchangeable hands and the signature red balloon. Window box packaging. 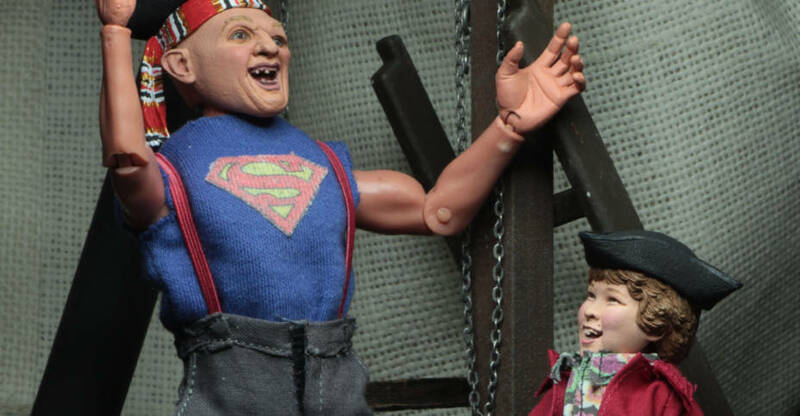 One of the big surprises on NECA’s display at Toy Fair 2019 was their The Goonies – Sloth and Chunk 8″ Scale Clothed Figures 2-Pack. The Sloth figure includes a pirate hat, a sword and, of course, his Superman shirt. Chuck includes his own pirate hat and a small classics statue of David. These are set for release in the third quarter of the year. Goonies never say die! 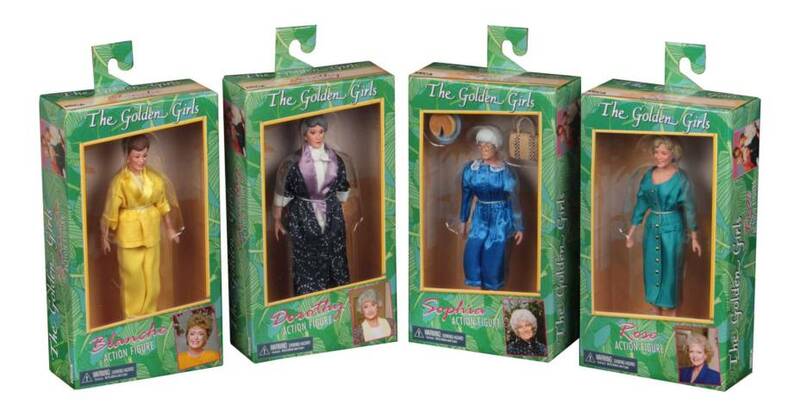 From the cult classic 1985 movie The Goonies, Chunk and Sloth join NECA’s line of clothed action figures. Both figures are fully posable for maximum pirate-treasure-hunting action. Sloth stands approximately 8” tall and comes with a sword accessory & pirate hat. Chunk stands over 5” tall and comes with a pirate hat and replica David statue with minor damage that Mikey’s mom will probably never notice.